Has anyone ever heard of The Emperors of Wyoming? If you haven’t, then you will very soon. This is a very unique band made up of four very talented musicians who decided to get together and record an album that was very special, very country, and very rock. This is The Emperors of Wyoming and they have produced something that many will want to hear over and over. Butch Vig, Phil Davis, Frank Anderson, and Pete Anderson make up this foursome that recorded a self titled album, even being miles apart from each other, never interacting except through the power of the Internet. Basically, these guys were “virtual band members.” After listening to this album, it’s hard to believe this album was put together without being in the same studio at the same time. It is so well done. No doubt, you can hear some great influences in this album such as The Band, Tom Petty, Neil Young, The Byrds, and Creedence. They don’t shy away from their mentors and make no “bones” about their sound. However for this writer, I feel any band of the past does not define them. This is a band as eclectic as they are; they have put together a sound that is different and makes The Emperors of Wyoming their own band with their own music. Honestly, if you think this is another pop country band, you are not even close. In the old days, country music used to be called “country and western music.” If you were going to give these guys a label, that one would be closer. However, their music is not quite that either. It is something that if this writer wanted to give it a name, I would probably call them “Back Country Rock.” Trust me, they have a sound so distinctive, you will wonder where these guys have been hiding and how their music occurred so naturally especially in the way they recorded this album. The album opener is a piece called “Bittersweet Sound of Goodbye” This number is so well written. As I was listening to it, many singer/songwriters come to mind, including Dylan. However, it’s “Avalanche Girl” that got my attention. Here, the music and lyrics are especially good. One line reads, “If you want me, nothing is free.” For some, that line is probably the understatement of the year. Then there is “Never Got Over You.” This number has its quality as well. I liked the line “Go to sleep to get relief, but you’ll be in my dreams.” I really enjoy the Emperors’ songwriting. But “Brand New Heart Of Stone” is my favorite. This piece is every guy or gal’s fantasy, having a potion or medicine to drive someone away. Emperors of Wyoming say it, “I won’t take the fall, but I’ll build a wall for this brand new heart of stone.” I love the way they repeat that statement over and over as if they are singing to convince themselves rather than sending a message to someone else. The music aspect is nicely done as well, sounding almost as if the band was performing a mysterious dream. “Sweep Away,” is another number that caught my attention, being a “patch up” song. “Sweep away the damage we done, sweep away the pain.” It’s ironic how we try to sweep something away; there is always something we miss. Then there is “Bless The Weather.” Once again I have to comment on their lyrics. They are so well said. “Bless the weather that brought you to me, curse the storm that takes you home.” “Pain after pain, I stood just to see how it feels.” These guys are talking about “real” struggles many go through with their own stormy relationships. “Bless The Weather” is another favorite. If you listen to The Emperors Of Wyoming from beginning to end, it is an album of many colors. It’s an album that was very well produced, and it should be, with Butch Vig producing such bands as Nirvana and Smashing Pumpkins. Listening to these well-put together numbers, one cannot feel at times being on a dream of their own. Their songs have such a human element, with their music providing the needed emotions that many feel when listening to works like this. 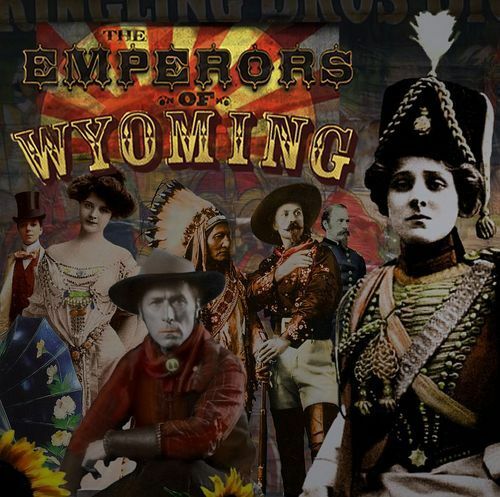 No doubt, The Emperors of Wyoming has an album that should take them on a journey of their own, or at least a place for “more to come” in future projects. This is Butch Vig, Phil Davis, Frank and Pet Anderson, and they are The Emperors of Wyoming.